I'm certain he won't mind me saying this but The Hubs is no Gordon Ramsey! He struggles to follow instructions and so when he tries to cook it generally goes a little wrong, he can bung some chips and fish fingers in the oven or some burgers and sausages on the BBQ but he and 'real' cooking don't go. 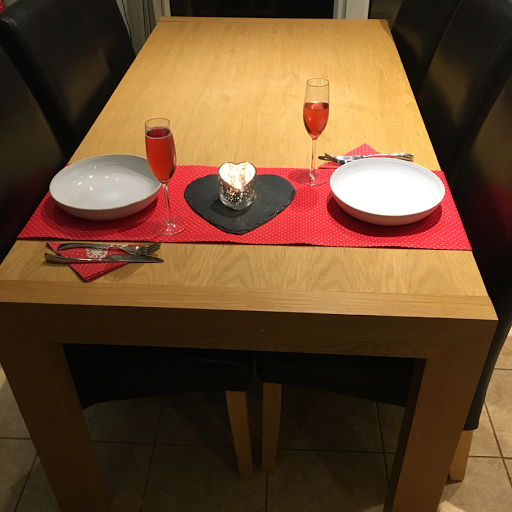 So, imagine my surprise when he announced last week that he was going to cook our valentines dinner, not only cook but choose the menu too! We celebrated Valentines last night as T was away at a sleepover and true to his word he came up with the goods! The menu he decided on was simple, delicious and reasonably cheap. It wasn't vegan sadly, but it was all vegetarian and he added chicken to his. 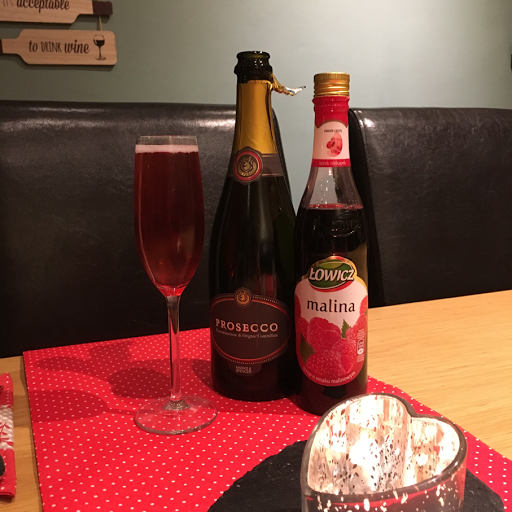 To make the 'valentines prosecco' we just added a tiny bit of Raspberry cordial to the prosecco, you could add Chambord or any raspberry liquor if you like. 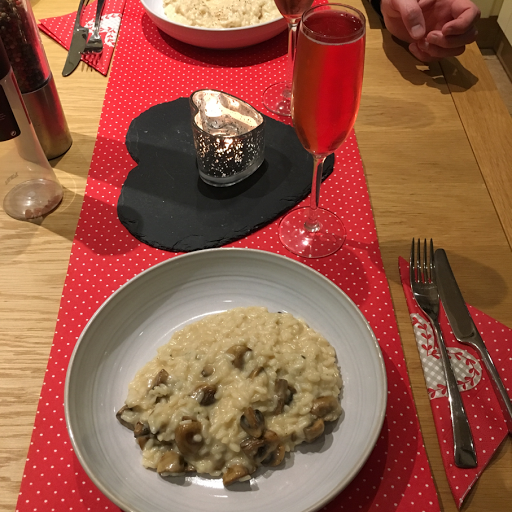 For his cheese risotto, The Hubs turned to his favourite TV cook Nigella and adapted her recipe I'll post the adapted version later in the week. 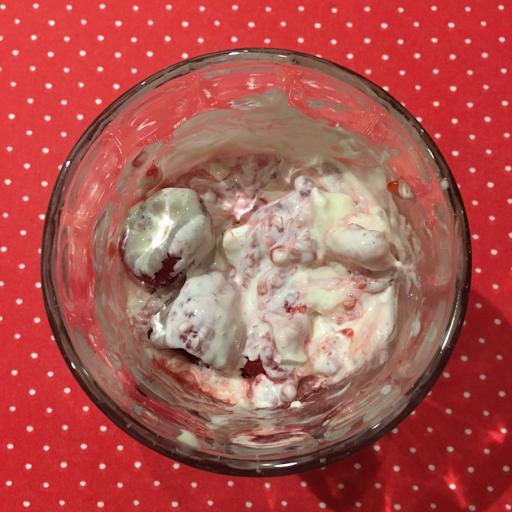 The Eton mess was simply half a punnet of raspberries mashed with a fork and mixed with a tablespoon of the raspberry cordial, again you could have used raspberry liquor. He then mixed 100ml extra thick cream with 100ml creme fraiche and stirred through a ready made meringue broken into pieces and the crushed raspberries. Assembling in a glass layering a few raspberries and the cream mix. It was delicious! I got a little red polka for table cloth and napkins to jolly the table up a bit, all our tablecloths are pretty plain so I thought this would look nice, and it did folded and ironed as a runner, I added a heart slate and heart candle we already had. 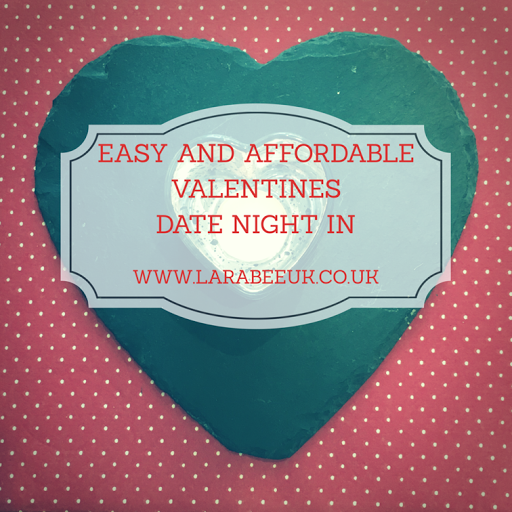 So as you can see for under £20 we had a lovely valentines date night, keeping it budget friendly wasn't The Hubs intention but just made the evening even better!!! Without the wine and tableware it would actually come out at under £10 for 3 courses for 2.
this sounds and looks lovely. Love the slate heart!